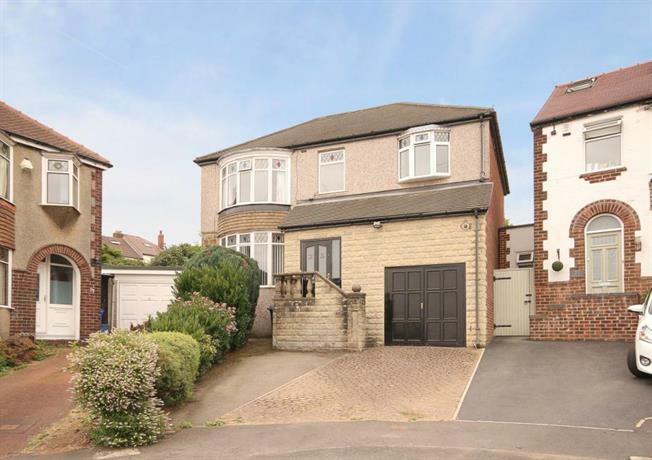 4 Bedroom Detached House For Sale in Sheffield for Guide Price £390,000. An excellent four bedroom extended detached family home situated well positioned at the head of the cul-de-sac within highly sought after location. The property offers spacious accommodation throughout, provided by two receptions rooms, four bedrooms, jack & Jill en suite, along with a separate family bathroom. A generous enclosed family garden to the rear, off road parking for two vehicles and integral garage. Offered for sale with the benefit of gas central heating, double glazing and NO ONWARD CHAIN INVOLVED. The accommodation in brief comprises: Entrance porch, hallway with stairs rising to the first floor landing, front facing Bay windowed dining room, rear facing lounge with attractive feature fire surround with living flame gas fire and patio style doors accessing the rear garden, breakfast kitchen with a range of wall and base units, integrated appliances to include gas hob, extractor fan, electric oven and dishwasher. First floor a Landing: Master bedroom has built in wardrobes and a door leading to a modern jack & Jill en suite shower room comprising: wash hand basin and low flush wc within a combination unit and shower cubicle having a mains shower within, tiling to the walls and floor, along with ladder radiator and extractor fan. Double bedroom two with front facing bay window, commands a fantastic view, along with double bedrooms three and single bedroom four. The family bathroom benefitting from a three piece suite comprising wash hand basin, low flush wc & bath, a separate shower cubicle has a mains shower within. Outside there is a front double driveway providing off road parking, access to the integral garage via up & over door, power/lighting. To the rear is an attached workshop with water tap/wash hand basin & lighting. Steps rise to the front elevation and to the rear an enclosed family garden being mainly laid to lawn with a raised block paved patio/sitting area where a couple of steps lead through to an area of garden where there are fruit trees. The property is well served by reputable local schools and excellent facilities at Banner Cross and Ecclesall including shops, restaurants and public transport facilities.